I know it doesn’t fit the narrative, but real antisemitic activists in the UK are NOT Labour Party or Jeremy Corbyn supporters. In fact, our investigation into thirty of the most active British anti-semites on social media show they are overwhelmingly strongly OPPOSED to Jeremy Corbyn. And all are on the far-right of the political spectrum, not the left. Real Jew-hating, anti-semites exist in the UK. Our investigation into the online presence of the most active anti-semitic activists on Twitter and Facebook, reveals anti-semites pretty much speak with one voice when it comes to their beliefs and policies. British antisemites are overwhelmingly right-wing and pro-Brexit, they hate Jeremy Corbyn, Labour and the Left in general, they LOVE Katie Hopkins, Donald Trump, Nigel Farage and the Daily Mail, – sharing their posts very often. Is anybody really surprised that people who hate Jews are right-wing and that they also hate Muslims or people of other religions, nationalities or races? But don’t take my word for it – see for yourself. These people are now operating openly with their hatred, safe in the knowledge that mainstream journalists will ignore them because they do not fit the false narrative of antisemitism on the left which is being used to smear Jeremy Corbyn’s Labour Party. 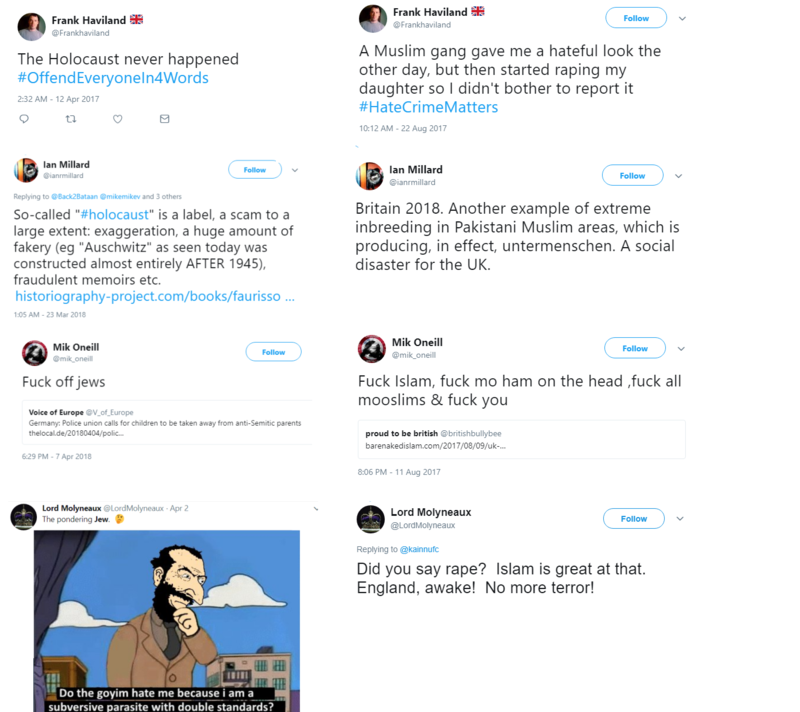 Here are links to some of the most active hard-line British anti-semites we investigated – ALL of them are right-wing. The real tragedy about the right-wing press using the false narrative that anti-semitism comes from the Left, is that the real anti-semites on the Right have become emboldened because they are being allowed by everyone to go about their vile business untouched and unnoticed. So please share. Thank you. Seems to me that if we can breed with one another we are possibly of the same species. What is this balderdash but an attempt to divide & rule? I thank God that I was born a white atheist. You left out Nick Griffin’s tweet of support for Jeremy Corbyn. To anyone taking this barrage of deceit and ill-spelled nonsense seriously, I recommend the book ‘Denial’, referring to the Lipstadt v Irving case some years ago. He too made out that the photograph evidence was faked. Photographic experts before the court proved otherwise. And there were still some witnesses around, one a relative of mine who saw one of these places for himself at liberation. Irving lost the case and at least four subsequent appeals. He was wrong, in other words, and paid for it. Thank you for showing us this awful stuff. The media would rather spread lies about Jeremy Corbyn than report this. I was pondering this earlier, and it’s no accident that anti-semites are the same people who hate multiculturalism. I mean the Jewish people were being multicultural for centuries before it was cool, and have contributed so much to the world in the process. The right try to peddle the lie that we cannot live together without somehow all losing our identity. Of course we can live together. We can do that, and work together for the benefit of all, in peace. It gives me great hope, and it’s one of the reasons why we must fight anti-semitism wherever it is, with everything we have. Anti-semitism is the enemy of us all. Don’t forget though that Irving was later hired by Andrew Neil to translate Goebbels’ diaries. A truly shocking decision. I understand that there are non-Holocaust deniers who could have translated them.